Want to start Harvesting Rainwater? This blog post is the second in the series of blog posts on harvesting rainwater checklist. Rainwater Harvesting Barrel System is usually the first step you’ll take as you start on your rainwater harvesting journey. I want to remind everyone to check your local regulations and restrictions on harvesting rainwater. Additionally, I would like to tell you before you consume rainwater to test and purify the water. Are you asking yourself How much rainwater can I harvest? With all the Barrel Systems available to purchase this may leave your head spinning. How do you decide which size barrel you will need? First, you will want to calculate how many gallons of water is available for you to collect. Using this calculator you can calculate how many gallons of rainwater. You will need to know the dimensions of your roof and the total rainfall in inches in your location. You will also want to ask yourself, Are you going to be collecting to replace all your water usage or to support your current water supply? No matter the answer to this question, One gallon harvested is one more than if you harvested none at all! A simple Rain Barrel System Method can be a recycled consumable grade plastic barrel or store-bought barrel. Either with a spigot to release the water or a bucket within to collect the water from the barrel. There are many videos on youtube to build your barrel system. This is the video I recommend most because the footage has easy to follow instructions and, also has the kit featured in the video available for purchase. If you’re making your barrel system, you want to make sure that the water always stays covered protecting the harvested water from mosquitoes and debris. Most Barrel Systems for sale through Amazon is between the price of 75 dollars to 500 hundred dollars depending on the size, materials, and if its a completed kit. With that mentioned, I would recommend recycling or build your barrel system to save on waste and save money. One method of Gravity Drip Irrigation System with your rainwater barrel system is a soaker hose. These porous hoses can save up to fifty percent of water compared to sprinkler systems and, will deliver more water directly to the roots of the plants. When the rainwater drips from the soaker hose to the soil, it will be at a reasonable rate which will keep the right amount of moisture. This is especially true when drip-irrigation is in conjunction with the use of mulch. My Permaculture Design Student Simone Ianuale uses the rainwater barrel system. He connects his rainwater barrel system to the drip to drip irrigation system, he puts organic fertilizer or microorganisms directly into the rainwater barrels that he will be using for his orchards and olive crops, he uses the fertirrigation system (fertilization and irrigation together) to irrigate his fertile soil. He also has barrels that go into a purifying system and then into the house for consumption. 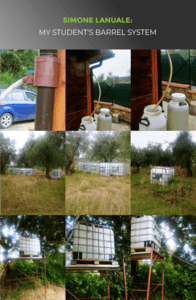 Simone is using his Rainwater Barrel system and Permaculture to harvest and use the natural abundance of rainwater to sustain his crops and his household. What are my next Rainwater Harvesting steps? 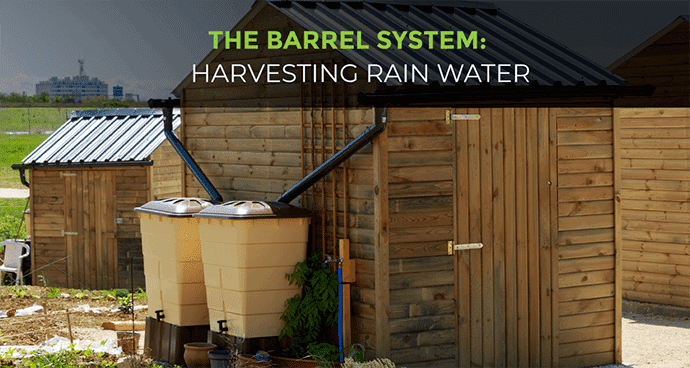 Rainwater harvesting using the Barrel System will help you lower or eliminate the utility bill, become more sustainable, decrease water and air pollution, and reduce your carbon footprint. What if you already have a successful Rainwater Barrel System? Your next step on the rainwater harvesting journey would be to look at your land and see if any of other methods would be beneficial to you. Could your area use a Swale? Are you interested in learning more about Keyline Design? Stay Tuned… Next Monday’s Blog Post will be the Key to Keyline Design. Please Note: Giuseppe Tallarico & World Permaculture Association are not an affiliate of any rainwater barrel systems. Any and All suggestions made in this post and all posts are not profitable!